I'd like to consider myself an authority on all things party in Charlotte. No, you won't catch me in the club every night, but you'll often find me at the events and venues that are worth my time...and yours. Plus, I've been writing about Charlotte's nightlife scene long enough that I know who the good (and bad) promoters are, which nightclubs are popping on which nights, and the types of crowds you can usually expect when you attend certain functions. My friends often email or text me asking me for suggestions when they're looking to go out. 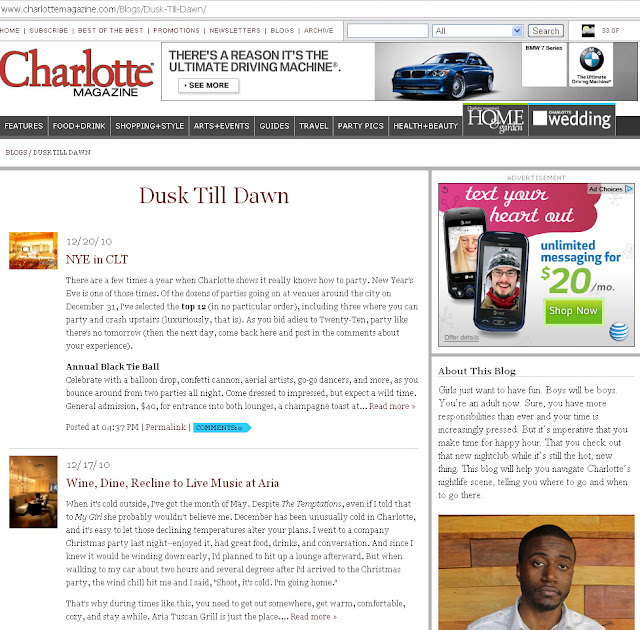 Now, I'm sharing that insight with you all a few times each week on Dusk Till Dawn, my new nightlife blog for Charlotte magazine. The blog has been up for about a week and a half, and with a handful of posts under the belt I think you can start to get a feel of what to expect. Plus, you can read my inaugural post, where I outline what I'll be blogging about on the regular. Today, I featured a post I'm particularly proud of and one I hope you will find extremely useful. I've given you my top picks of New Year's Eve parties in Charlotte, "NYE in CLT." That's the kind of service I look forward to providing you--making it easier for you to know which parties and social events are worth your time and money. Rather than posting long lists of events going on, I'll comb through the clutter to hopefully make your nightlife decisions easier. And on the occasion that I do give you a long list, you can still count on me highlighting my recommendations. So bookmark www.charlottemagazine.com/Blogs/Dusk-Till-Dawn/ and visit often. Tell your friends to do so as well.